When the children return to school in September it starts another year of capturing memories. From the photos of them in their nice, new uniforms standing outside their new classroom to their very first piece of artwork that they have bought home. School milestones like playing a donkey in the Christmas nativity, taking part in the school sports team and having fun at sports day. These are all memories that both parents and children make throughout the school year but how to you capture these? Do you take a snap on your phone, share it to Facebook and then only look back when you are feeling a little nostalgic about your little ones growing up too fast? Why not capture these memories and have them printed on to a slim photo canvas. Choose whether you showcase their back to school photo, a snapshot of them with their friends or another school day memory. With prices starting at just £17.99 and available in a range of different sizes. 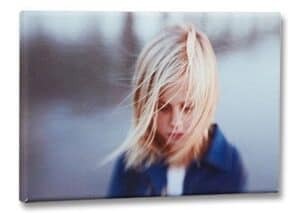 The slim design makes the canvas look and feel sleek against any backdrop and would look great standing on a shelf in a child’s bedroom or hung with pride in the family photo gallery wall. 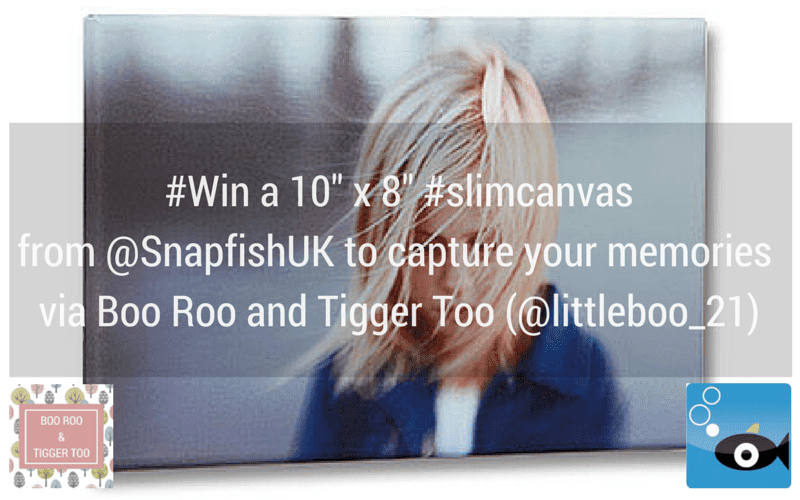 To give you the chance to relive your back to school memories Boo Roo and Tigger Too have teamed up with Snapfish to offer two lucky readers a 10″ x 8″ Slim Photo Canvas each. I would love to capture my son meeting his new brother or sister for the first time. I’d like to capture a picture of our dogs. I’d use a cute photo of the kids! We recently had pictures taken of our two year old daughter, and have moved into a new house would love to get one of the pictures printed on a canvas for the living room wall! our springer spaniel when he was a puppy. I have a lovely photo of my 2 year old daughter playing with her 5 month old brother. My childrens first family portrait. Hopefully a lovely sunny pic from our holidays but if the weather is awful then I have some great ones from last year! Photo of my children cuddling each other. I’d like a photo of my three boys. I’ve got loads of them when they were little, but I’d like a new one of them now they’re older. I’d love to frame a picture of my little boy running towards me smiling after I pick him up at nursery. He’s just started and I do fret that he isn’t enjoying it. A nice holiday snap or family photo. We just had some pictures taken and we got a great shot of the kids lying on their bellies looking at the camera, they look so angelic I can’t believe they are my kids!!!! I have a picture of my dear departed Dad with my three boys which would look beautiful on canvas. I’d love to frame a picture of my son with his 81 year old grandma on our recent holiday together. it would have to be a family photo of us all together ! One of my kids together, smiling!! I’d love to have the beautiful newborn professional photos of our baby boy on canvas. Our wedding day as we only got the photos back yesterday and I can’t stop looking through them! A photo of my children having fun on holiday. A picture of my grandson on a camping holiday in Wales. I’d love to get a nice family picture taken. I would like a picture of my two children. My kids on the beach on holiday. Niece’s first day of school. I got married on the 13th, so I’d capture a wedding photo! I would like a picture of all my five grandchildren together. I would choose a photo from one of our days out this summer. My Daughters first holiday ! I would capture a picture of our dog that dies last year for my dad. I am getting induced tomorrow (wish me luck!) with baby 2 and I would love to capture the moment my 3 year old son meets his baby brother! Our wedding day in Gretna Green. My little boy holding the first fish he caught this summer. I’d love to have a lovely family photo that we had taken last weekend in London to put on our living room wall as a real talking point! My daughter kissing my ‘pregnancy’ bump! We have a lovely photo. The magnificent wildlife I saw on safari in South Africa. I’d love to get the whole family, pets included! I have some great landscape photos from my travels and would love to put one on a canvas! One of my mums favourite photos I’ve taken of my little sister and baby brother sharing a lollipop. a photo from our holiday.